Today, half of America’s internet shut down when hackers unleashed a large distributed denial of service (DDoS) attack on the servers of Dyn, a major DNS host. It’s still unclear exactly who carried out the attack and why, but regardless, the event served as a demonstration of how easily large swaths of the web can be wiped out if attacked by determined hackers. Starting at 11:10 UTC on October 21th-Friday 2016 we began monitoring and mitigating a DDoS attack against our Dyn Managed DNS infrastructure. Some customers may experience increased DNS query latency and delayed zone propagation during this time. Updates will be posted as information becomes available. It’s horrific to know that major websites like Twitter, Spotify, Reddit, Etsy, Wired, and PayPal can all be taken offline in an instant. The exact process hackers used is so far unknown—aside from the DDoS detail—but it’s important for every internet user to understand because it has to do with how exactly the internet works. With that in mind, here is how some of the most popular websites in the world can be taken offline in a flash. Domain Name Servers (DNS) act as the internet’s phone book and facilitate requests to specific webpages. They make sure you end up in the right place every time you type a website into your browser. Hackers will occasionally attack DNS providers in order to bring down the sites they are serving. Today, that happened to be Twitter, Reddit, PayPal and more. That’s a really basic overview. But if you really want to understand how DNS works at a deeper level, you have to follow the complete order of operations. 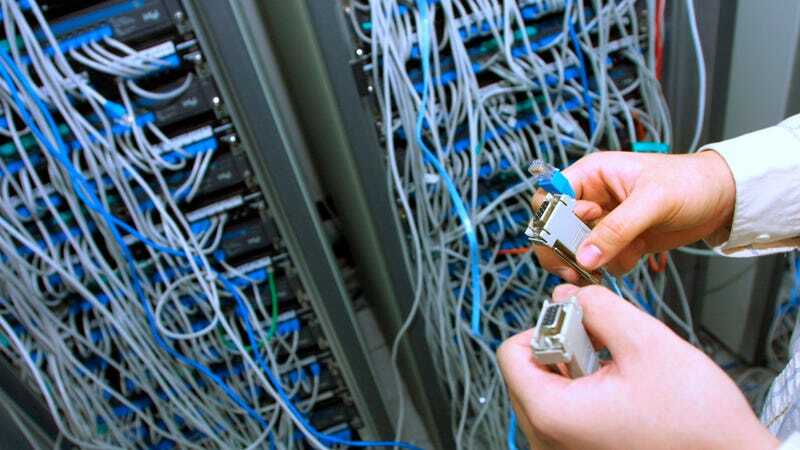 A typical internet user starts at one of many computers in a large network connected through underground cables (such as your laptop). The individual nodes on these networks communicate by referring to each other with numbers known as IP addresses. DNS is used to translate a request like a URL into an IP address. When you enter a URL - such as www.goldenbattles.com - your browser starts trying to figure out where that website is by pinging a series of servers. It’s very detailed, and we won’t bore you with the complete chain of events. There are resolving name servers, authoritative name servers,domain registrars, and so on. The system is precisely configured to get you from browser bar to website seamlessly. The process is a little crazy, but perhaps the most insane part is that it all happens almost instantly. Anytime you’re browsing the web, opening dozens of tabs, requesting a bunch of different websites, your computer is pinging servers around the world to get you the right info. And it just works - until it doesn’t. A DDoS attack is a common hack in which multiple compromised computers are used to attack a single system by overloading it with server requests. In a DDoS attack, hackers will use often use infected computers to create a flood of traffic originating from many different sources, potentially thousands or even hundreds of thousands. By using all of the infected computers, a hacker can effectively circumvent any blocks that might be put on a single IP address. It also makes it harder to identify a legitimate request compared to one coming from an attacker. In the case of this morning’s attack, hackers brought down the servers of Dyn, a hugely popular DNS host that manages sites like Basecamp, CNN, Etsy, Github, Grubhub, HBO Now, Imgur, Paypal, Playstation Network, Reddit, Squarespace, and Twitter. When the servers of Dyn were taken down, browsers essentially couldn’t figure out where to go to find the information to load on the screen. This type of attack happens every so often when hackers create a little army of private computers infected with malicious software known as a Botnet. The people that are often participating in the attack don’t realize their computer has been compromised and is part of a zombie army of attackers. In 2014, a hacker group called Lizard Squad shut down the Playstation Network and Xbox Live using this method. In 2015, a trojan virus called XOR DDoS helped hackers create a powerful botnet capable of taking down almost any server or website. Defending servers against DDoS attacks can be difficult, but there are ways to prevent outages. According to Network World, one of the most common methods used is flow sampling, in which the system samples packets and identifies trends in network traffic. A flow analytics device evaluates traffic streams and identifies potentially bad traffic. Looking ahead, one big question stands out. How can we avoid attacks like this stealing internet access away from millions of Americans and losing companies millions of dollars in revenue? The answer is complicated. As soon as security companies come up with new ways to protect companies like Dyn, hackers come up with new ways to attack them. In the case of DNS infrastructure, however, many point out that the best way for a website to avoid getting brought down by an attack on one host is simply to subscribe to multiple hosts. This is called DNS redundancy, and it’s probably the reason that some sites (like Pornhub) survived the attack unscathed. In the case of the Dyn servers, it’s unclear exactly how they solved the problem, but the company is now reporting the issue resolved—about one hour after the problem started.